Far eastern themed online slot games are very common within the casino slots market and 108 heroes is definitely a great addition to the genre. 108 heroes is based upon tales of ancient warriors, and samurais who possess ancient Chinese spirit – this is why they are apparent across the reels. Become the 109th hero and spin today to earn yourself a significant cash reward and perhaps some oriental free spins. Microgaming has been contributing to the online casino industry with some of the most exciting and innovative slot experiences for everyone to enjoy and return to for more and often features on the Easy platform. Their vast collection of themes, their impressive graphics and high levels of entertainment all contribute to their reputation among players. 108 Heroes focuses on the Chinese culture, including samurais, geishas and other characters that are easily identifiable even if you’re not very knowledgeable. Take a trip to Asia and see what prizes you can find! 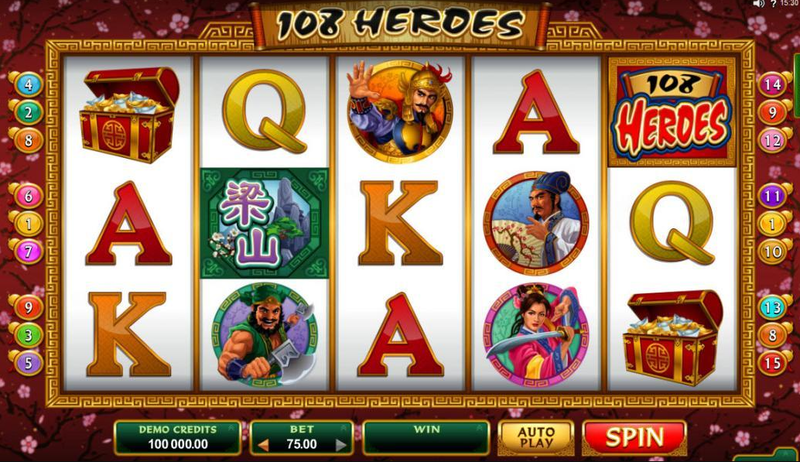 The theme of 108 Heroes is centred around the rich culture of China, from which elements such as cherry trees and fans are incorporated into the design of this slot game. If you were ever curious about the far East, you can now venture in the middle of it, while discovering treasures. You’ll also encounter brave warriors, who are ready to fight with the forces of evil, using impressive weapons and dressed in traditional clothes and armours. This slot game has 5 reels and 15 paylines, surrounded by a graceful and elegant red background, filled with cherry tree flowers. The ornaments are golden and specific to the culture. The music is also traditionally Chinese, so the experience is completely authentic, down to every detail. You can bet starting from 1.0 credits and going up to the maximum bet of 75 credits. There is also the option of auto-spin, so you can just sit back and enjoy what this game has to offer. The symbols of this game are beautifully designed in a cartoonish way, while keeping close to the theme, representing different kinds of Chinese heroes, along with the regular Ace, King and Queen. The most valuable one is the warrior with the golden armour, who can reward you with up to 2.500 credits if you spin 5 matching symbols. The Wild Card of 108 Heroes is the Logo symbol, and it substitutes any other symbol on the reels, besides the 2 Scatters, in order to form more winning combinations. If you spin 3 or more Chinese Letter symbols, which is the first Scatter, you trigger 10 Free Spins. Every win made during Free Spins is multiplied by 3x its value. The second Scatter in this slot game is the Treasure Chest symbol. By spinning 3 or more of them, you activate the King’s Treasure Bonus Game. Then, you are presented with 12 identical chests, from which you can choose 3, 4 or 5, depending on how many symbols you got on the reels. In both corners of the screen, there are two heroes to assist you and make sure you make the right decision. You can win as much as 2.500 credits during this Bonus, so watch out for those treasure chest symbols!